Penarth has been called the garden by the sea, owing to the floral displays along the esplanade, and is one of the last resorts in South Wales which still has a Victorian pier, where you will find a snack bar open on a chilly day. We opted for Chips and ice cream. This famous pier was built in 1894, is 658 feet long and has been recently restored and refurbished. Penarth is a regular port of call during the summer months for the cruise ship Balmoral, and also the Waverley the last sea going paddle steamer in the world. 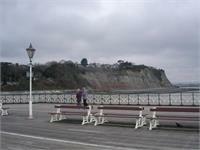 The town of Penarth still retains an air of Victorian style with its elegant buildings. 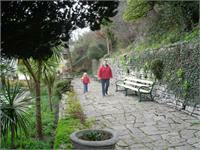 It has a good selection of shops and a park. The esplanade is ideal for a stroll, or for the more energetic, a coastal path leads to Lavernock Point, an important site in the history of communication. 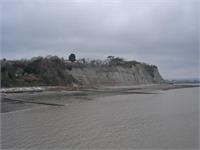 It was from here in 1897 that Marconi sent the first radio transmission across the water to Flat Holm a nearby island. 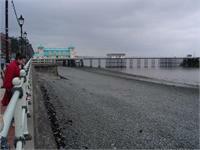 We stopped a the car park on the seafront and had easy access to the pier. We actually stumbled upon the pier, but if you are seeking it out you leave the M4 at Jct 33 onto the dual carriageway following signs for Barry / Penarth. Leave on the 3rd exit signposted Penarth then town center. Before reaching Penarth be on the look out for the brown signs for the Marina as it is a good point to see and walk along the Cardiff Bay barrage, started in 1994 completed in 1999. Built in cast iron with a timber deck, the original pier was no more than a landing jetty and promenade. Facilities were extended in 1907 when a wooden pavilion was erected at the pier-head, and shops placed along the neck. When the pier was sold to the local council in 1926, they later made further additions including a new concrete landing stage and a shoreward end pavilion. A very pleasing structure, architecturally, the pavilion remains as the most notable feature of the pier today. 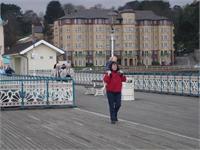 Although relatively recent in pier building terms, the history of Penarth Pier has not been without incident. During the August Bank Holiday of 1931 a fire started in the seaward end pavilion, spreading almost the entire length of the pier within just a few minutes. Some 800 people on the pier at that time managed to reach the shore in safety, despite having to enlist the services of a pilot cutter and local yachtsmen to rescue those people that had become marooned at the pier head. Whilst dancing in the pavilion the alarm had been raised and several people left via a rear entrance only to realize they have no way of escape. Despite the heavy seas, they were all eventually brought safely back to shore. The pier head, deck and shops were re-built at a cost of £3,157, but the wooden pier-head pavilion has never been replaced. Soon after the Second World War, Penarth Pier experienced a second major mishap when the 7,000-ton Canadian 'Port Royal Park' was driven against the pier in a severe gale, destroying a large section of the structure. Repairs took two years to complete and cost some £28,000 to underpin the cast iron columns and install concrete columns at various points. Steamer traffic had always been the mainstay of Penarth Pier and it was a cause for great concern when the White Funnel cruises, run by one of the area's most famous shipping operators, P & A Campbell Ltd of Bristol, ceased operating in 1981. The MV Balmoral and PS Waverley, operated by the Paddle Steamer Preservation Society, do thankfully continue to call. Removing the pier toll, allowing free fishing, and providing a regular program of summer entertainment has, since 1982, helped the pier to remain a popular venue with locals and visitors alike. 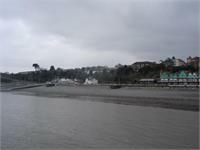 In recent years this regular usage has rightly justified considerable sums of money being spent on fully restoring the 650ft (197m) pier and, in May 1998, a formal re-opening of Penarth Pier took place. 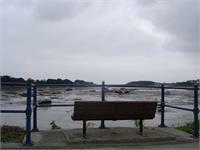 The man was found unconscious near Penarth pier, say police who are investigating what happened.